Walt Wiley is captivating as outlaw Wild Bill Hickok this Sunday in GUNSLINGERS on AHC. 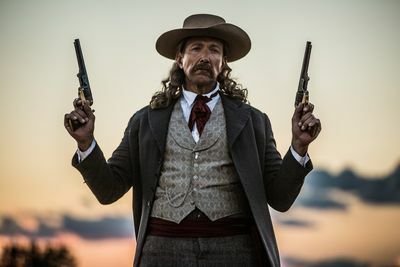 The action-packed six-part historical docudrama GUNSLINGERS continues on American Heroes Channel August 17, 2014 with episode, “Wild Bill Hickok: Marksman … and Marked Man.” Captivating as well as informative, GUNSLINGERS tells the true stories of infamous icons and legendary conflicts of the American Wild West period of history. Juxtaposed with vivid reenactments, expert commentary is layered throughout each episode to ensure the authenticity and historical accuracy of each story. This week, Walt Willey will take on the face of James Butler Hickok, known by many to be the face of the Old West, all at once dashing, daring and deadly. “Wild Bill” Hickok was the most famous sharpshooter of his era, always eager to tell his story, whether true or not, many of the tales making the newspaper equivalent of “going viral” in his day. Wild Bill truly earned the title of “Wild,” and he played every adventurous role one could find on the frontier: Indian fighter, gambler, lawman, prospector, outlaw and scout , as well as always spinning more tales for an America clamoring for heroes. However, in the end, it all became too much for one man to carry when, ultimately, his legend became a fatal burden. Walt Willey plays the legendary Wild Bill in Sunday’s all-new episode of GUNSLINGERS. Born in Ottawa, Illinois, Willey left for New York in 1981 to break into acting professionally. After numerous off-Broadway productions, he joined the cast of ABC’s long-running soap opera, “All My Children,” in 1987, playing the role of lawyer Jackson Montgomery until the show’s end in 2011. The versatile Willey branched out into stand-up comedy in 1990, entertaining across the country, and was inducted into the famous and prestigious Friars Club in 2001. In 2009, he co-founded a regional community theatre in his hometown of Ottawa, where the locals have presented “The Odd Couple,” “Arsenic and Old Lace,” “Plaza Suite,” “Harvey,” and “Deathtrap,” as well as original works of local historical significance. Additionally, Willey regularly hosts charity fundraisers, and developed the Willey World Endowment Fund, benefiting children’s charities. Currently, Willey is touring with the one-man show he authored, “Wild Bill! An Evening with James Butler Hickok,” often in conjunction with his “Wild Bill! In-School Program” for high schools. So, Willey seems the perfect choice to portray Wild Bill in this American Heroes Channel presentation of the legendary hero’s life. GUNSLINGERS airs on the American Heroes Channel on Sunday nights at 10/9c.